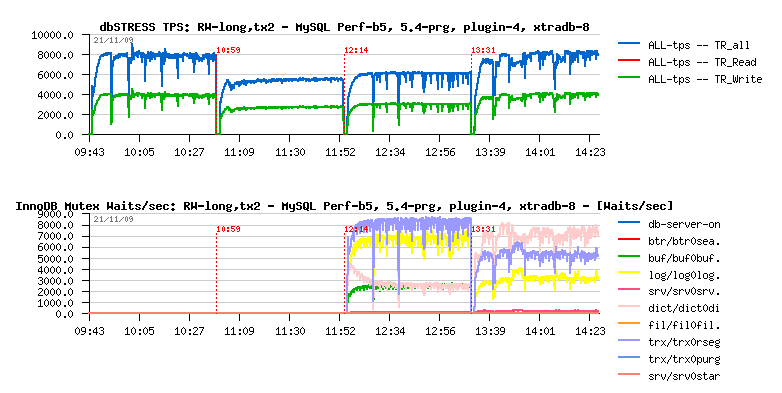 MySQL Performance: Breaking limits with XtraDB ! I've just finished my benchmark report about InnoDB current hottest internal contentions on the dbSTRESS workload. Since InnoDB-plugin-1.0.4 there is an excellent feature was added by Innobase team to monitor internal mutex lock waits: a compact output of "SHOW MUTEX STATUS" become much more useful then before! and helps greatly to understand InnoDB limits! I've integrated innodbMUTEX stats within dim_STAT monitoring and was able to see performance limits from completely different axes! on the same workload and using X4450 server (Intel CPU, 16cores, 16GB RAM (unfortunately all more powerful servers were busy :-)) as well it was sad for me that I've not used the updated XtraDB-8 code during my latest tests (there was something wrong with uploaded sources during announces, and I've discovered it only after discussion with Yasufumi)..
placing XtraDB-8 in the #1 position! NOTE: lock waits stats are not available for MySQL 5.4 and build5, but you may compare plugin-1.0.4 and XtraDB-8 profilings - they are very different the one from other! And observing their lock waits levels you may easily understand why XtraDB today out-performs all others!.. Because it has already combined together all most important improvements from MySQL 5.4 and InnoDB-plugin! It already implements extended rollback segments! And it already implements some fixes for dictionary locks! I'll avoid to copy & paste my report to the blog post, and will just say you that I was able to improve performance by 37% (!) again by using available in XtraDB features! Any comments ate welcome! And I'll be happy if you may share any lock waits observations regarding your own workloads (production or testing - doesn't matter)!